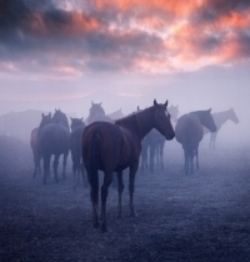 In my dreams, I see you -- The Gift of Horses in Our Midst. Buckskin, silver dapple, chestnut, black. Others called you red dog, big dog, elk dog. Then Seabiscuit, Stormy, Silver Blaze, Flicka. The Strawberry Roan, The Chestnut Mare. A Horse With No Name. But here, Medicine Horse...here you have been named. I place my hand on your strong shoulder. with patience, power, strength and knowing. and sharing the space of your sphere, you take me as I am. Your strong hooves and my feet -- rooted on the same patch of earth. and the deep, fluttering breath of calm. We breathe energy and healing. in the arena or on the trail of life. I ride the rhythm of your trot; your hooves as smooth as river stone. The graceful twists and turns spiraling like aerial silks or a gentle breeze. Sweat drenched, you carry me through wind swept air. You neigh and nicker, whinny and sigh, prick up your ears and swivel them toward my face -- reminding me to use my voice. You see me, too, and you take me as I am. Help me to remember harmony within the herd, and all the gifts of horses in our midst.